The real estate market for golf and residential amenity communities has changed dramatically over the recent decade. The National Golf Foundation reports that more than 600 courses were closed between 2006 and 2013. Many of the Great Recession’s golf course closures occurred within residential communities. This downturn has forced developers, property owners, associations and managers to come up with new answers on how to best attract and serve today’s buyer. And they have responded—with new ideas, new planning concepts and evolving new development trends. Further good news is that today’s economy is much improved and home sales are recovering. Haig Point, SC: Waterfront & equestrian are important amenities. The U.S. Census Bureau also reports that demographics are changing. For the first time in U.S. history, the Boomer generation is no longer the largest one. Today’s Boomer population of 75 million has been surpassed by Millennials which now totals 83 million. These two groups represent the largest segments of today’s real estate market. Boomers are living and working longer, looking for opportunities to connect with others and stay engaged with kids and grandkids. More than the generation before them, they are seeking healthy and active lifestyles with multi-generational activities. 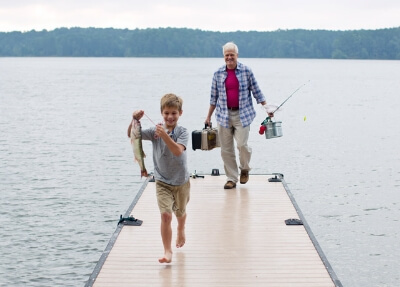 Reynolds Lake Oconee, GA: Outdoor, multi-generational gathering spaces reinforce ties to family and nature. They feel the need and desire to have authenticity and want to be part of something important, to be good stewards of the environment and to continue learning. Millennials are also looking for authenticity and active lifestyles. In addition, they are high tech and plugged in and want opportunities to stay connected to their peers and family. They are skeptical regarding real estate value and want to live, work and play with others in their cohort. The generations grow closer with mutual interests & shared fun. Many desire urban living in cities or village-like settings surrounding the urban core such as NoDa, the popular arts district in Charlotte, NC, or the Virginia Highland in Atlanta. Today, people have less leisure time and want to engage in meaningful activities with others. Communities are focusing on these and other lifestyle trends as they plan and develop amenities to better attract buyers. Today’s buyer is looking for meaningful shared interests. Access to nature, walking and biking, canoeing and kayaking, multi-generational swimming pools and recreation facilities have become must-have amenities. In addition, you’ll find more small, quaint retail villages organized around civic open spaces for community events and festivals. These are the key amenities you’ll see in today’s most successful communities. WindRiver, a lakefront and golf community in the East Tennessee and Knoxville area is a good example of a community that is being transformed to appeal to today’s buyers. WindRiver, TN: Wide open spaces, nature & a lakefront lifestyle. WindRiver, formerly known as Rarity Pointe, was part of the Rarity Communities group which included multiple large scale communities developed and marketed primarily as golf course communities. This community, now under new ownership, is being transformed into an active lifestyle, lakefront community with trails, open spaces and parks. It also offers a recreation amenity with a multi-generational swimming pool and recreation center, an inn and a marina with a club lifestyle on Tellico Lake. New development activity at WindRiver is organized around multiple gathering places and centers of activity. These areas are complemented by diverse real estate offerings and amenities that appeal to a broad range of buyers and demographics. WindRiver, TN: Renovated golf course plays shorter. Golf is still very much in the mix, though. The golf course has been renovated, new tees were added to shorten holes and make play made more enjoyable. The beautiful golf course also serves as an amenity and a welcoming open space that enhances the rolling English countryside feel of the community. 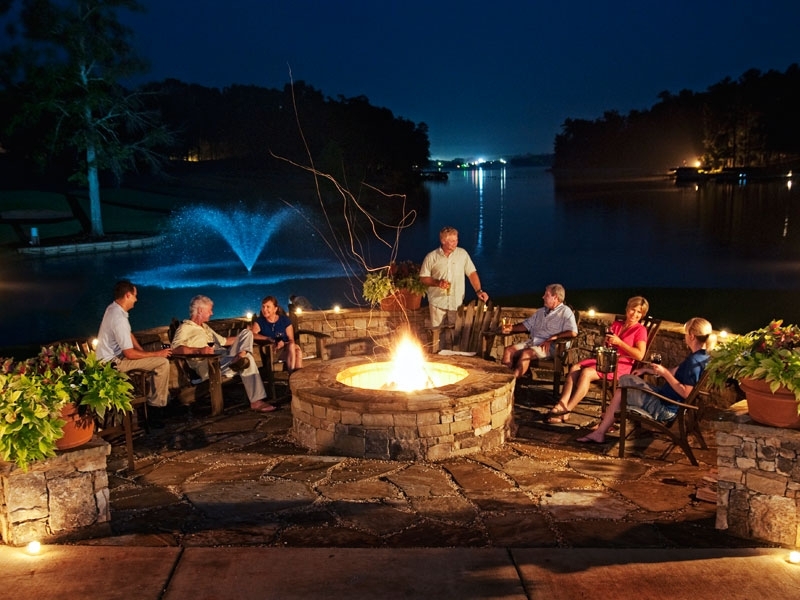 Oldfield in Okatie, SC is another example of a successful amenity community with golf. An active lifestyle community, Oldfield offers a full range of choices and amenities embracing the outdoors. The stunning Greg Norman-designed golf course is now just one aspect of a full and rich experience. Oldfield, SC: The Country Store, a reminder of old times. Wellness, nature-based activities, historic assets and learning are all important aspects of life at Oldfield. This community was designed to reflect and enhance its rich cultural history and farm-like equestrian setting overlooking the Okatie River’s marshes and creeks, and it does. The good news is that golf today can remain as an important recreation component, adding to a communities’ open space qualities, sense of place and recreation offerings. There are, after all, some 25 million golfers out there. So in today’s changing market, look for forward-thinking communities with golf that are diversifying community life by providing recreation and learning opportunities that build on their unique qualities and sense of place. The Field Club, Martha’s Vineyard, MA: Easy in, easy out for all. Communities that have golf as an amenity will continue to offer it, but golf will no longer be the central defining amenity and social hub. Look for communities that provide opportunities to gather and socialize in village greens, multi-generation recreation centers and swimming pools. See if they have access to nature, biking and walking by water. These are the communities that will be the most attractive to the current and next generation of buyers. Mark Baker is President of Wood+Partners Inc., a regional land planning and landscape architecture firm with offices in Hilton Head Island, SC and Tallahassee, FL. In addition to being the firm’s President, Mark serves as the firms Director of Marketing and Partner-in-Charge of numerous public and private sector projects. He is also a Founding Member of the GCH Retirement Planning Advisory Board. Oldfield, SC: The outfitter center by Wood + Partners. The firm’s work covers a wide range of project types throughout the Southeastern United States and Caribbean. Projects include large scale mixed-use residential communities, new commercial town centers, downtown revitalization master plans, resorts and hotels, colleges and universities and large regional parks. Mark’s projects have received numerous awards throughout the years.